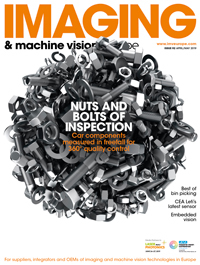 North American sales of machine vision components and systems have reached $709 million in the first quarter of 2018, an increase of 19 per cent year-on-year, according to statistics issued by AIA, the industry’s trade group. The record quarter is a continuation of the strong growth the machine vision sector experienced in 2017 in Europe – Germany in particular – and in North America. The machine vision components category grew 28 per cent to a new record high of $107 million during the first quarter of 2018. The growth in components was primarily driven by camera sales, which increased 44 per cent to $65 million. Optics (16 per cent to $12 million) and software (9 per cent to $5 million) markets also experienced growth. The machine vision systems category increased 17 per cent to $597 million in the first quarter of 2018. Within the systems category, sales of smart cameras climbed 26 per cent to $109 million, while application specific machine vision (ASMV) systems grew 16 per cent to $488 million.